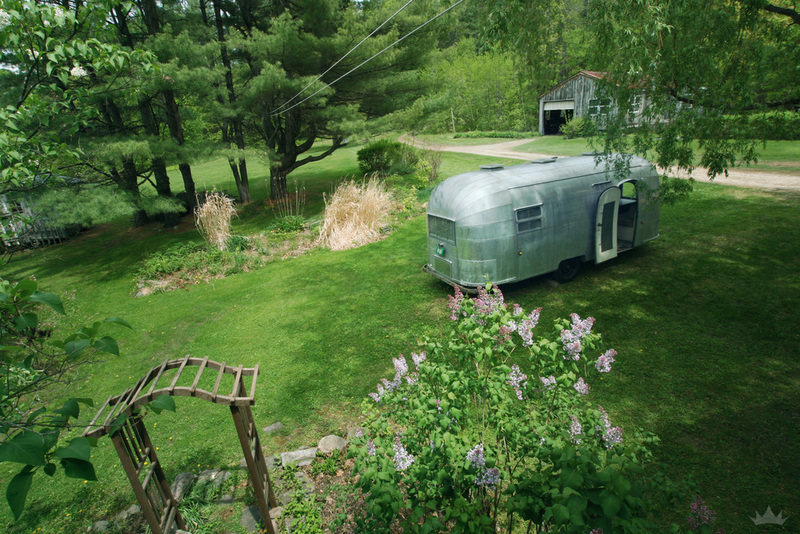 Suzie Q is the first Airstream addition to our ESK family. 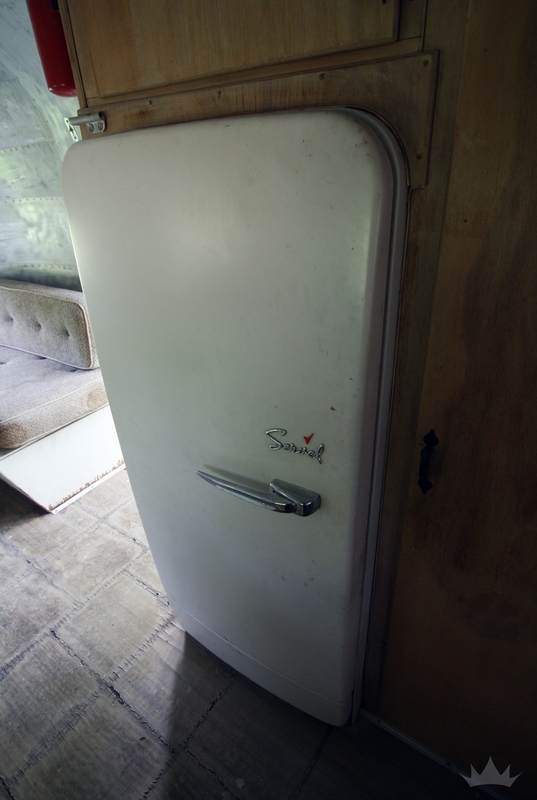 This 1953 vintage beauty spent most of her life in barns and storage containers from Minnesota to Ohio. Now we are fully restoring her from the outside in, taking her on the road along the way. The plan is to keep the overall design as authentic to original 50's style as possible... while adding our ESK twist. 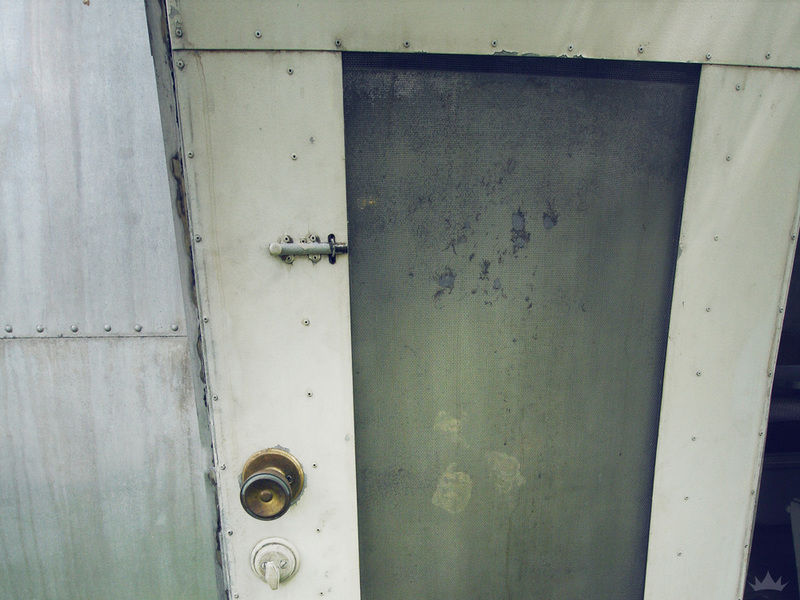 We have fully polished the exterior including the inside of the door. The tongue, bumper, and rims have been painted black and we tinted the windows true to ESK fashion. The original tile floor was in disrepair and thus removed and replaced with vinyl, faux wood flooring. 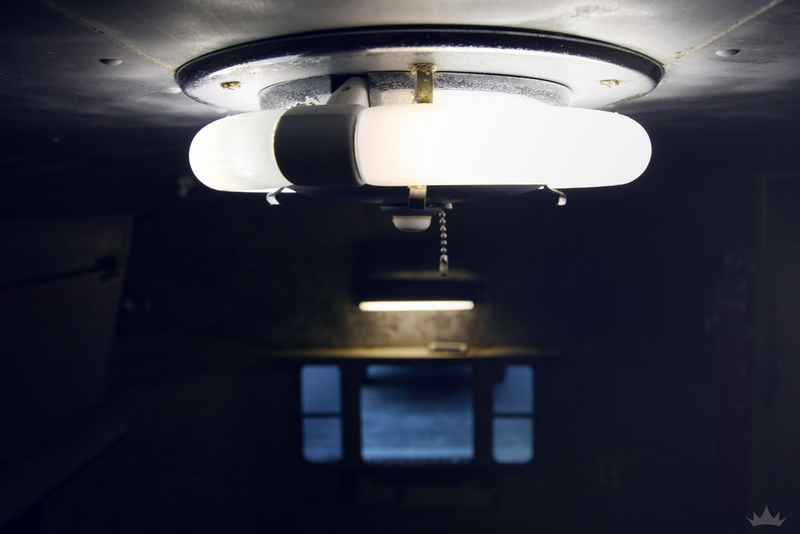 The exterior running lights were replaced with original glass lenses. Overall, Round One went to the exterior. Suzie is now shined up and glowing from the outside, while her interior sits ready for its full makeover. Keep scrolling to follow her process so far! Getting a new trailer home or into the shop is always exciting, but after the initial glow of your new buy wears off.. you quickly realize how much work is there to be done. We dove into this project immediately to get Suzie ready for her first event a mere month away. Our first step is always to properly catalog the exterior and interior details of the unit as they are when we received it. No matter your intentions with the project in the end, we believe this is an important step! Not only can it be handy to catalog the time and money you've put in, it is fun and informative to see how far the transformation has progressed along the way. 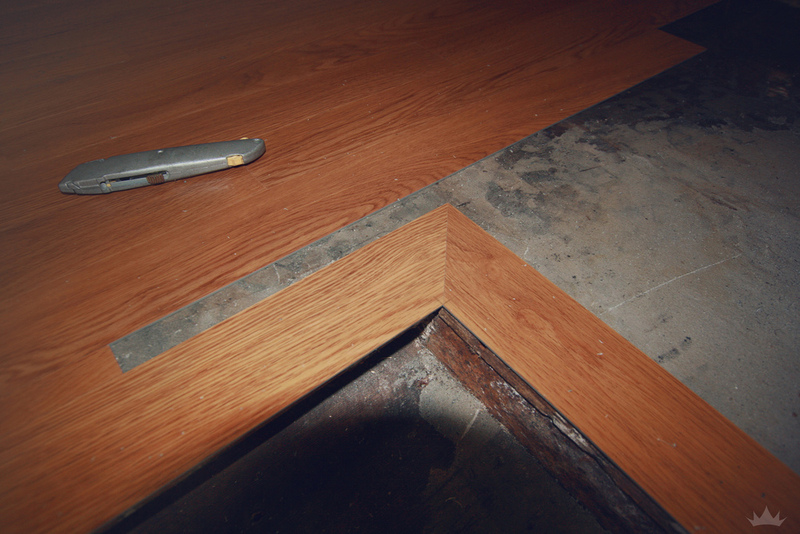 Once every inch was visually documented, we began removing old and broken items like the flooring, destroyed seals and damaged hardware. With a short timeline of one month, we gave ourselves a tight but reasonable goal of replacing the floor and polishing the exterior in time for the event. Justin, our resident pro-polisher took on the messy task of making Suzie Q shine. 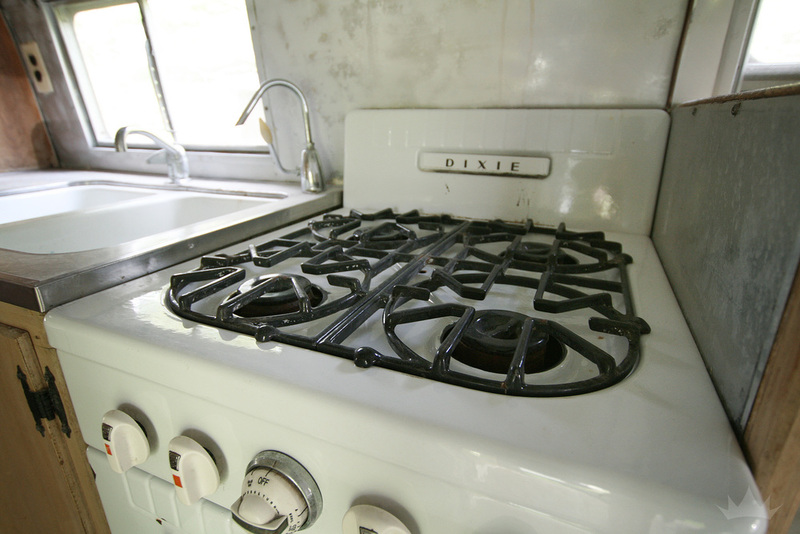 It doesn't take long after diving into any renovation project, trailer or building, to find a maze of issues or obstacles you might have initially overseen. That's one of the reasons we are so adamant about taking on projects that you can handle and preparing yourself mentally and financially for unforeseen challenges that will most likely arise. Our first setback came in the form of silver spray paint. 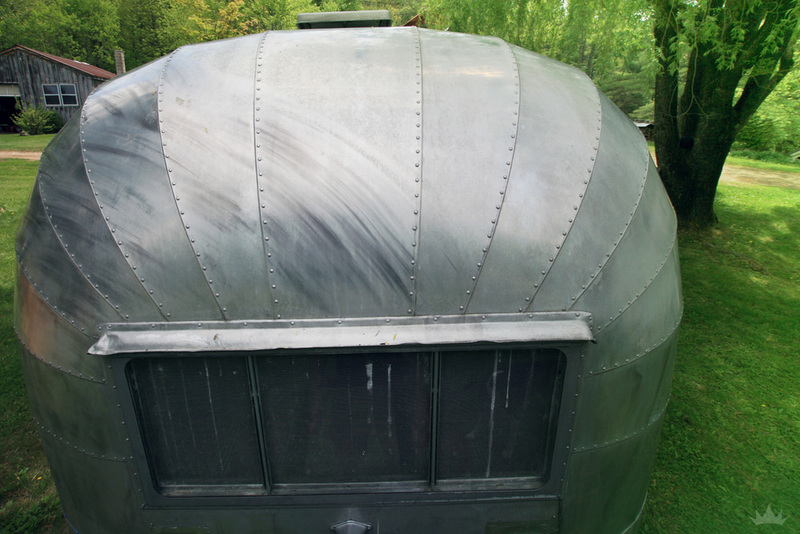 Let us start out by saying NEVER spray paint anything directly on your Airstream in a random fashion... or near your Airstream without accounting for over-spray... and ask yourself if the things you are painting really need to or should be painted that way. 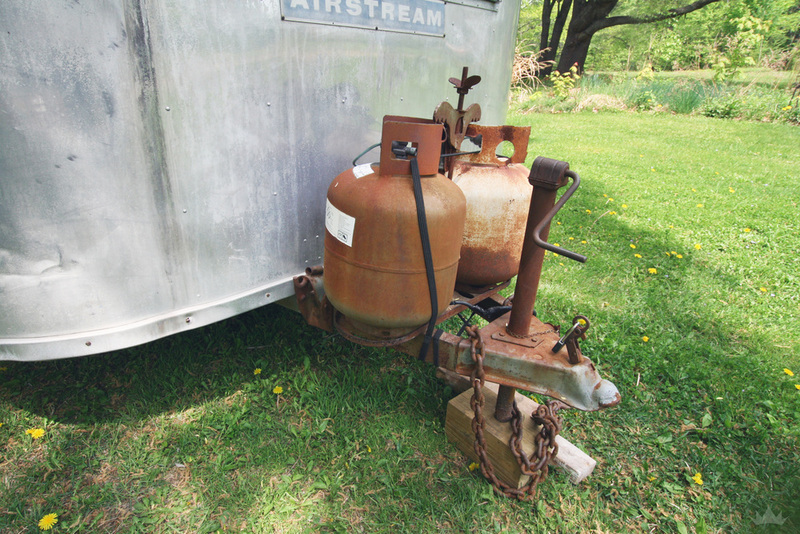 This takes away from the value of the trailer and causes issues down the road for yourself or future owners. 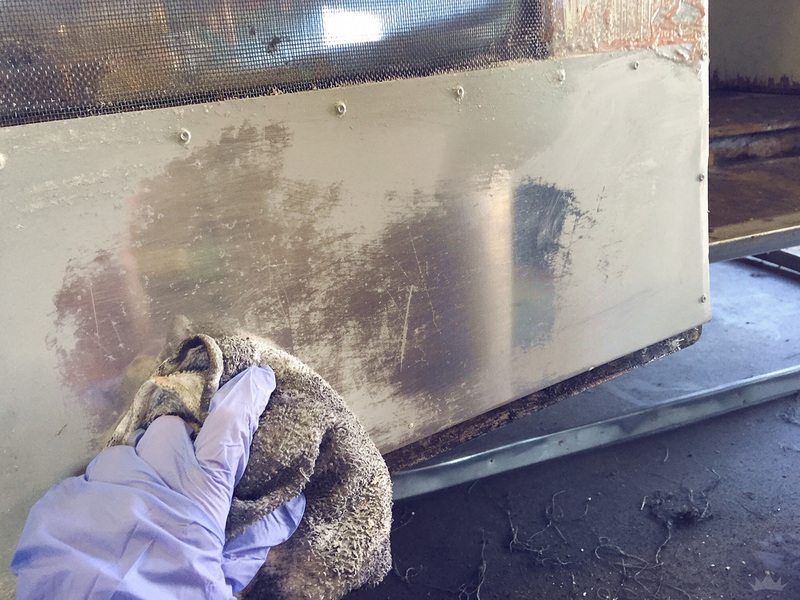 Paint needs to be stripped off from the surface of the aluminum before you can do a proper polishing job. If not, you will either find it impossible to get a mirror-like finish, or you will ruin your equipment in the process trying to work through the paint. Gunked-up wheels and burnt-out motors just add to the overall cost of your project, and create unnecessary frustration that can be easily avoided. Similar problems can arise when using the wrong type of tape directly on the aluminum, and leaving it for long periods of time. If you find yourself in a similar situation, with over-spray on the exterior or a painted door you want bare metal instead, you can do like we did and turn to paint-stripping products. These products come in a variety of strengths and methods of application. They offer an effective way to remove buildup without harming the aluminum underneath. 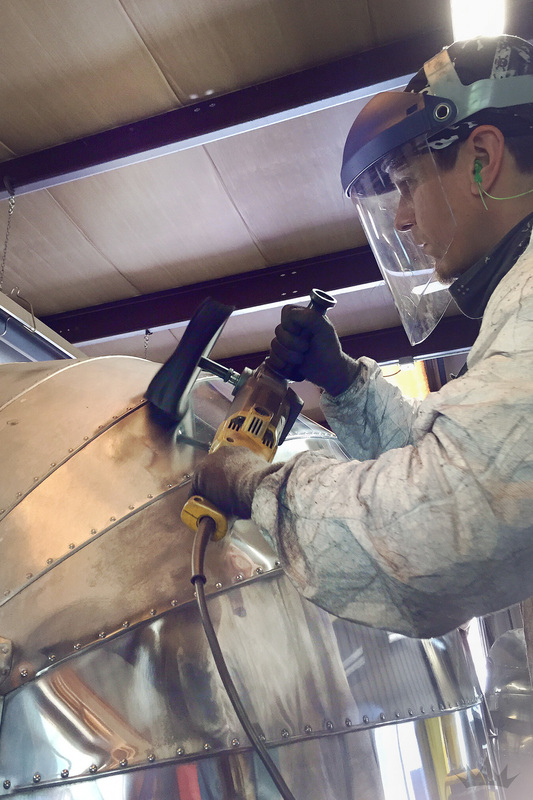 Avoiding abrasive alternatives like grinding, soda blasting, or sanding is key if you want to reach a flawless, reflective surface in the end. We found that the quick-acting spray option was enough to tackle the thin paint randomly scattered along the exterior. But the product that saved the day was a longer-sitting gel option that did it's magic after about 30-60 minutes. This not only ate through 3 0r 4 layers of paint, it removed baked-on duct tape, tree sap, and even old silicone seals around the door. 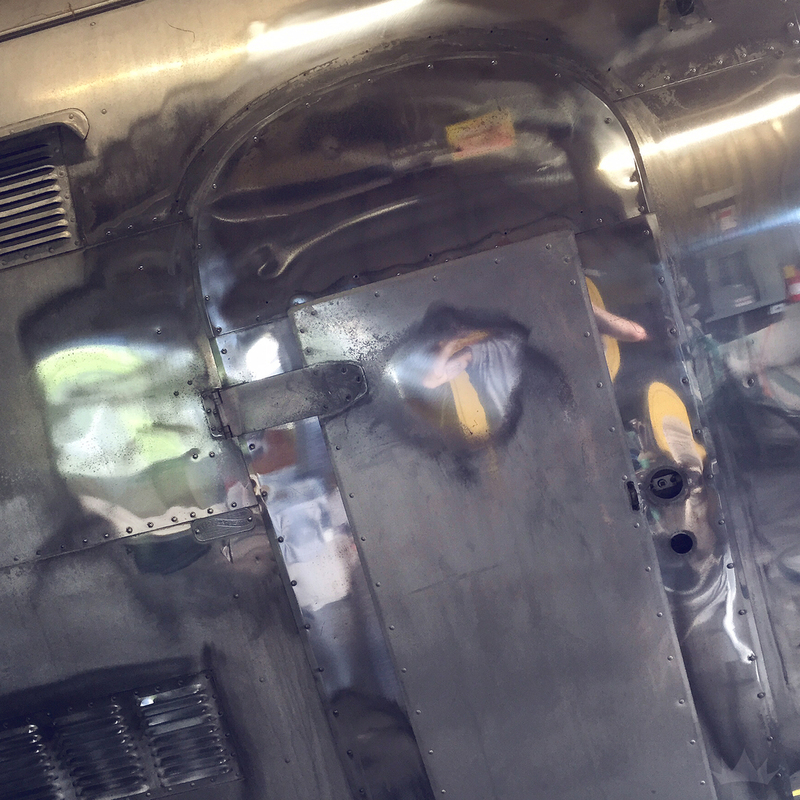 By cleaning the surface so well, even around the doors and edges of things, we were able to polish every inch of the exterior to give the most impressive outcome possible. 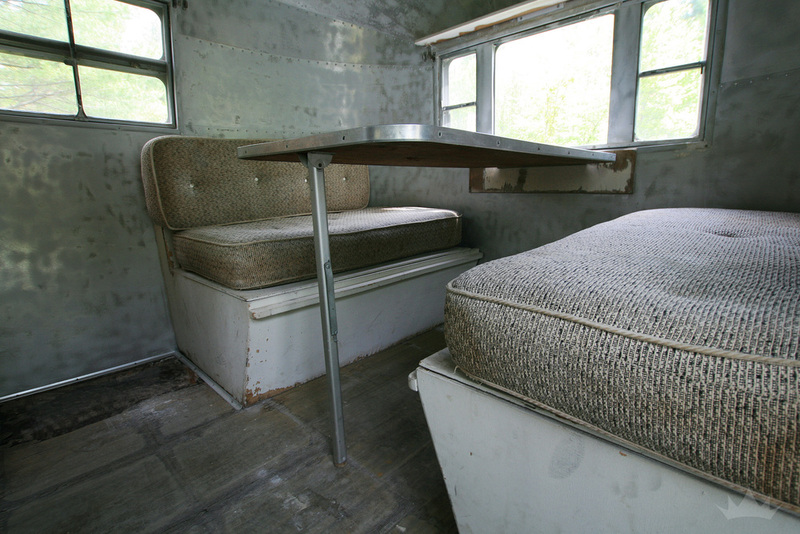 With special help from the team at Lawton Floor Design in Brattleboro VT, we were able to get a durable and attractive vinyl floor for our Airstream's interior. They made the experience enjoyable and seamless, getting the product to us quickly so we could make our tight deadline. We will definitely be back for future projects! 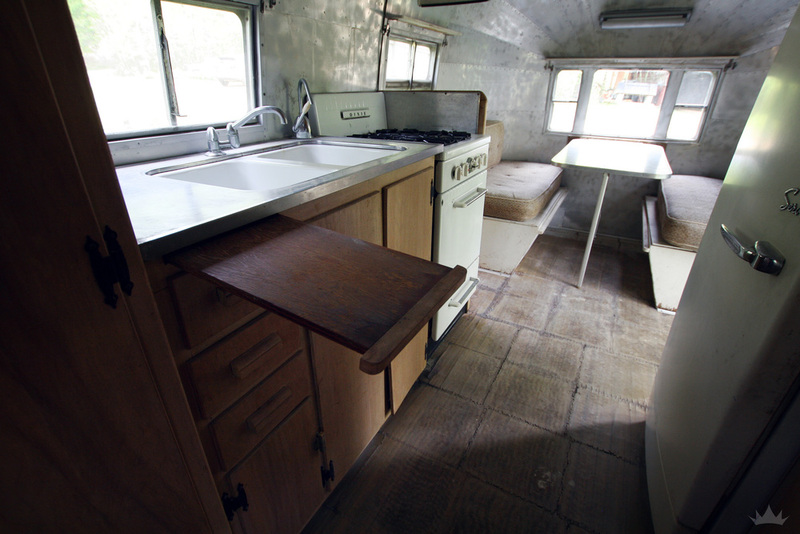 The floor of this trailer shows how you can take certain design liberties when doing restorations. There are many pleasing qualities about the different eras and their fads, but then there are some flops. In such a small space, classic 50's checkerboard or avocado green tiles wouldn't bode well spanning the interior. Instead, we opted for a more traditional style that would highlight all other elements from the earlier time period. It's about mixing old with new and finding the right design balance. This can be applied to your own interior projects no matter their location. Taking visual breaks from busy or eye-catching elements with neutral fillers helps highlight what needs to be highlighted, without overwhelming the space. Eames had it right in saying " The details are not the details. They make the design." The small elements of a project are extremely important, yet often overlooked. If you skimp out on the personal touches, the end product will suffer. But if you take the time and care to finish off each stage cleanly or creatively, the project will benefit as a whole. The interior floor we laid is a good example of this ideology. We began by pulling out the furnishings we could with the time constraints we had. Although we would prefer to clear the trailer completely before installing a floor, time and budget don't always allow for that. When that happens to you, roll with it! Setbacks create new opportunities. We used a lightweight vinyl option that was amazingly easy to cut and came in 3" thick strips. This made it a breeze to fit the flooring around complex corners, curved walls, and to slide under currently immovable objects. Taking extra time to measure around objects in order to keep the offset pattern consistent are one of those small details that goes a long way. 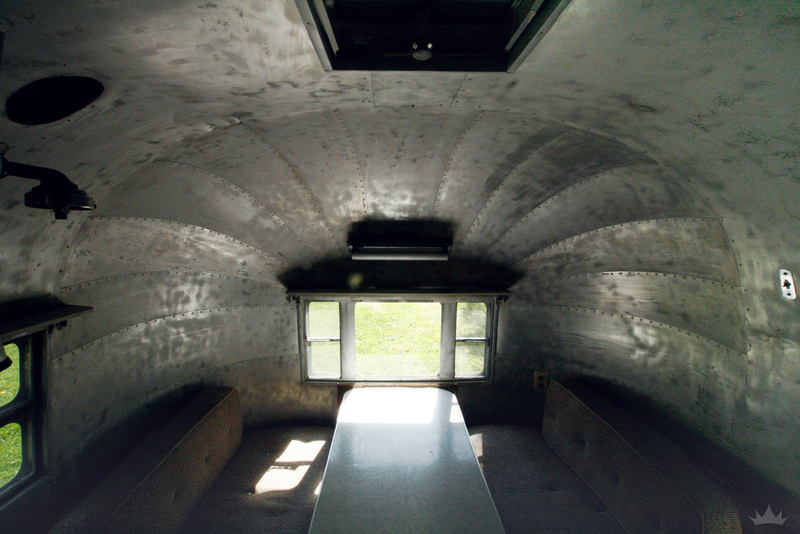 Another example is the framed step leading into the trailer. With this simple mitered element the entryway is now brought to the next level. These components may seem small or insignificant, and may even be unseen by some, but if they were missing or wrong their absence would be glaringly obvious. 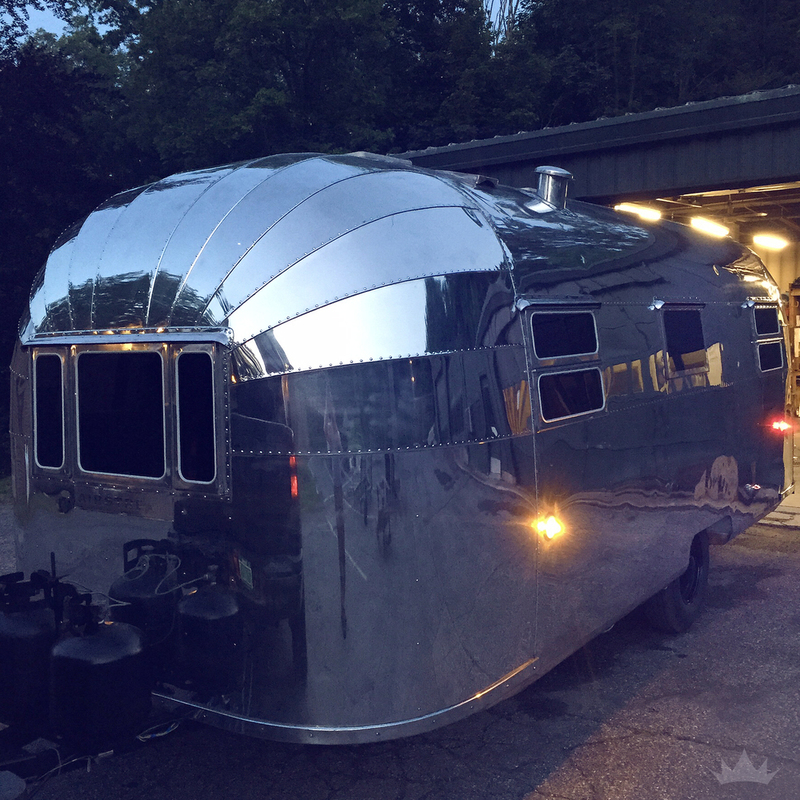 We were extremely lucky to be given original 1950's pieces that were built in or bought for our trailer when she was first produced. One of the most impressive of these antiquities is the awning room shown here. 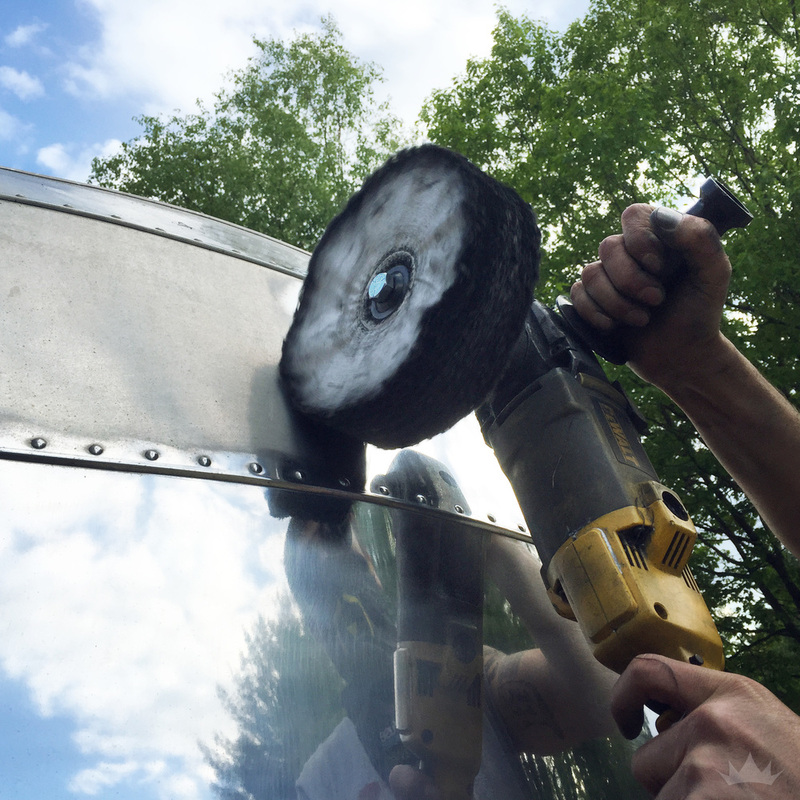 Made out of an Army canvas material with painted stripes, this multi-part extension adds a great amount of covered space to the Airstream's exterior. 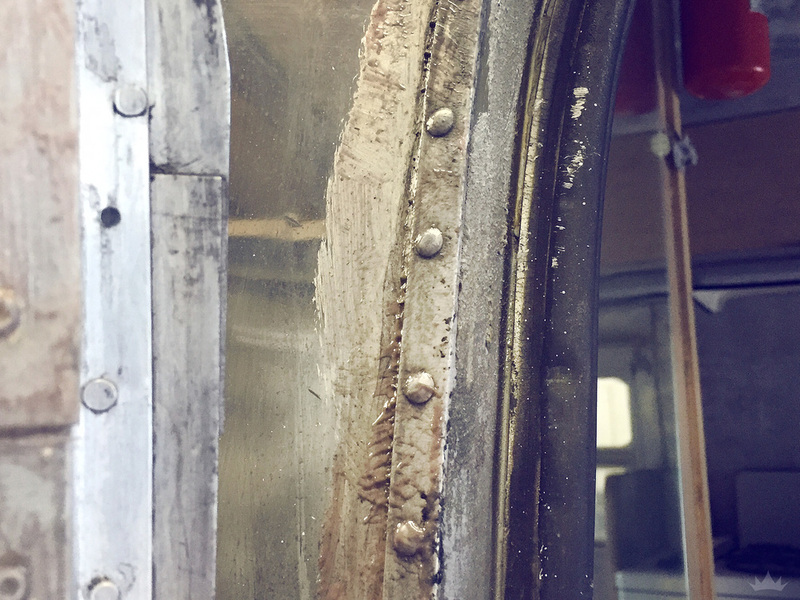 Being made of old material and oil-based paint means that the years were not so kind to our new heirloom. So we packaged it up and shipped it to rising star Jean Bundschuh of Tin Can Awnings to reproduce in a fabric of our choice. We've known from day one that we want to incorporate minty teals and red accents into Suzie's design inside and out. Going with a pin-up inspired stripe, we searched until we found this beautiful vintage looking fabric from Sunbrella. It has that matted down mint color and exudes the classic feel the original green awning lacked. That is the best part about restoration after all. Taking all the best parts of eras past to highlight in your design... while cutting out the styles and structures that weren't so successful. Military green nixed for beautiful, subdued mint. For now, we have just replaced the main part of the awning on top. We are in the middle of picking apart the walls with Jean to learn the snap and hook system used in creating the walls of the outdoor room. She is excited to get things squared away so she can start offering others this option for their trailers. 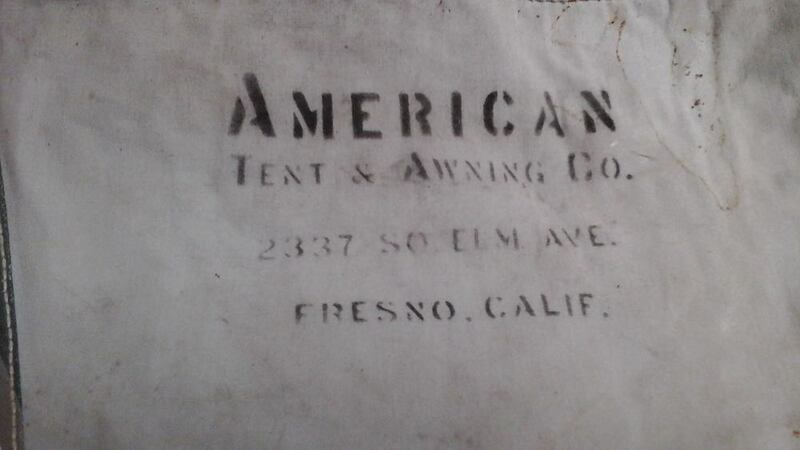 IN NEED OF AN AWNING? We very highly recommend checking Jean at Tin Can Awnings out on Facebook to see her past work (all categorized in the albums) and speaking with her about your project. She is great in helping you choose fabrics, taking the time to copy elements precisely if needed, and working efficiently to get the finished product to you in a reasonable amount of time. If you would like to choose your awning fabric we recommend finding one through Recasens since that is the company she works with directly. Don't forget to tell her "hello" from ESK!